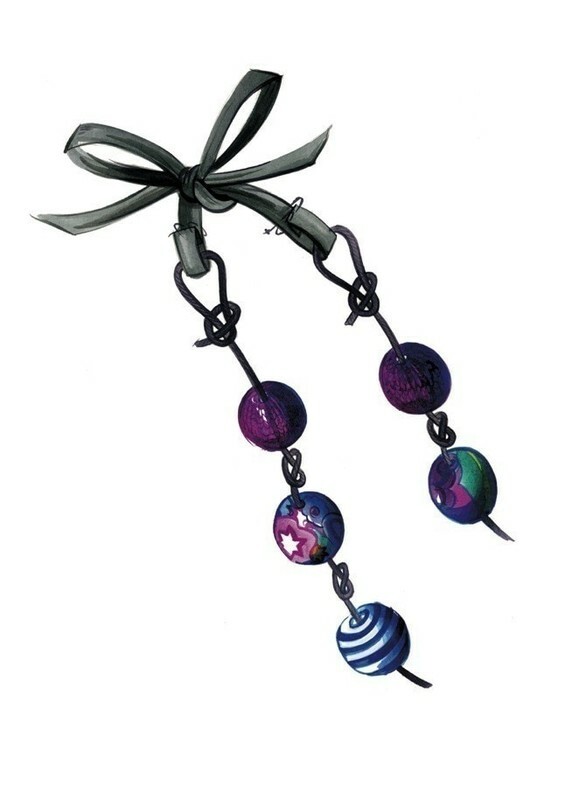 Create a gorgeous necklace with Erika Knight. Fabrics, yarn and ribbons in tonal hues of blues, basalt and burgundy, with flashes of fuchsia and turquoise are used to create this multi-crafted necklace. Beads are wrapped in printed fabric of basic double crochet. From the book Beads & Buttons by Erika Knight. Read our review here. Posted by Beads & Buttons • Published 20th April 2009 © 2019 Erika Knight / Quadrille · Reproduced with permission. Wrap three large beads (A) and six medium (B) beads in assorted fabrics. Cover 10 medium beads (B) with crochet - two in grey, four in burgundy and four in fuchsia. Base ring with yarn and crochet hook, make 6 ch and join into ring with a slip stitch. Round 1: 1 ch, 10 dc in ring, slip stitch to first dc. Round 3: 1 ch, 1 dc in each dc to end, slip stitch to first dc. Repeat round 3 four times. Fasten off and sew in yarn ends. Tie a slip knot in one end of the rat tail cord. Thread one large fabric bead onto the cord and position at the centre. Tie a knot at each side of the bead to secure. Thread another two large fabric beads, one at each side of the first bead, and knot. Thread three medium fabric beads on each side and knot. Thread five crochet beads on each side, with the last bead covering the starting slip knot. Tie a slip knot at the other end of the necklace. Poke the end of the cord through the hole of the last bead with the aid of a knitting needle. Cut the ribbon in half and sew one half to each loop created by the the slip knots. Tie the ribbon ends together in a bow. 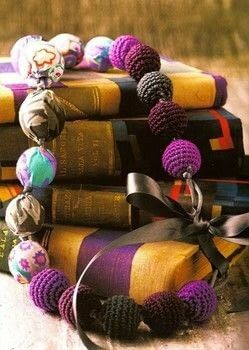 Beautiful use of fabric, made a similar one but it was a bracelet made with felt, sparkley & shop bought crochet beads. I will post my version later. Thanks later.